Ishant Sharma had really bad recent 3 bilateral series against Australia, New Zealand and South Africa. He didn't perform well with ball at all and because of his poor performance he was left out of ICC World Twenty20 2014, which India lost to Sri Lanka in final. Sharma was really disappointed for missing World Cup and nearly decided to retire from ODI. But his mother motivated him and asked him to think positive. Sharma has put his disappointment aside and is focus of IPL 7. Ishant Sharma told media, "I am looking forward to do well in the new season. I am bowling well. I am in good rhythm. I played in domestic Twenty20, bowled well, took some wickets. 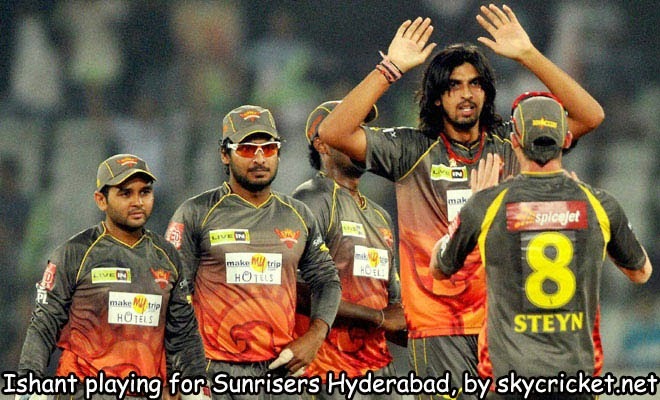 I am confident with my bowling and hopefully I will do well for the Sunrisers this time as well." Ishant Sharma has been playing domestic cricket to stay in good rhythm, better performance in IPL 7 might open doors to international team again. He is playing for Sunrisers Hyderabad in this season of IPL and his experience will no doubt give franchise an edge over others.